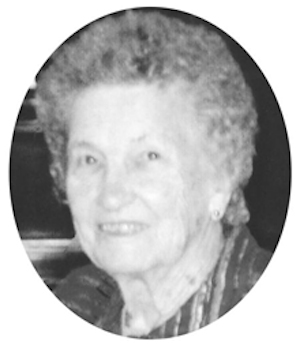 Obituary – Wells, Virginia (Dufek) « Perry High School Alumni Association, Inc.
– daughter of Mr. and Mrs. Geo. Dufek of Perry, was born in Perry on. Jan. 20, 1920. She attended elementary grades in Perry and attended high school in Perry. 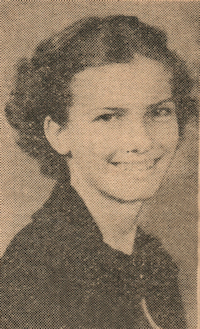 During her high school career she was a member of the Red Hots, National Honor Society and Student Council. Following graduation she expects to work. Virginia G. Dufek Jones Wells, 93, of Germantown, Tennessee, was born on January 20, 1920 ten miles north of Perry, Oklahoma to George and Anna Skalenda Dufek. She passed away on Friday, October 4, 2013 in Memphis, Tennessee. She graduated from Perry High School in the Class of 1937. She lived in several small towns in Oklahoma before she moved to Little Rock, Arkansas and then on to Memphis, Tennessee. Virginia married her first husband Frank Marley Jones Jr. in 1941. He preceded her in death on May 30, 1943. She married her second husband John Jackson Wells in Woodward, Oklahoma in 1947. He preceded her in death in March of 2000. Virginia’s hobbies were quilting and dressmaking. She was devoted to her family and to her Perry roots. Graveside services will be held at 2:00 p.m., Thursday, October 10, 2013, at Grace Hill Cemetery Pavilion in Perry, Oklahoma. Rev. Roger Dunn will officiate. Services are under the direction of BrownDugger Funeral Home. Family will receive friends from 1:00 pm to 2:00 pm on Thursday, October 10, 2013 at BrownDugger Funeral Home in Perry, Oklahoma. Memorials may be made to the charity of the donors choice in care of BrownDugger Funeral Home, 1010 N. 7th Street, Perry, Oklahoma 73077. Virginia is survived by her son, Frank J. Jones and his wife, Judy of Germantown, Tennessee two grandchildren, Michael Allan Jones of Nashville, Tennessee and Cheryl Catherine Jones Hurley of Germantown, Tennessee three greatgrandchildren, Jake Hurley, Lauren Hurley and Julianne Hurley all of Germantown, Tennessee nieces, Patty Bay Strothman and Bobbe Bay Huston. She was preceded in death by her first husband, Frank Marley Jones Jr. husband, John Jackson Wells parents, George and Anna Dufek brother, George Dufek Jr. sister, Dollie Dufek Bay niece, Glenda Bay Bartlett.